Redis is an open source, in-memory data store that gives you the opportunity to store and access data quickly and efficiently. 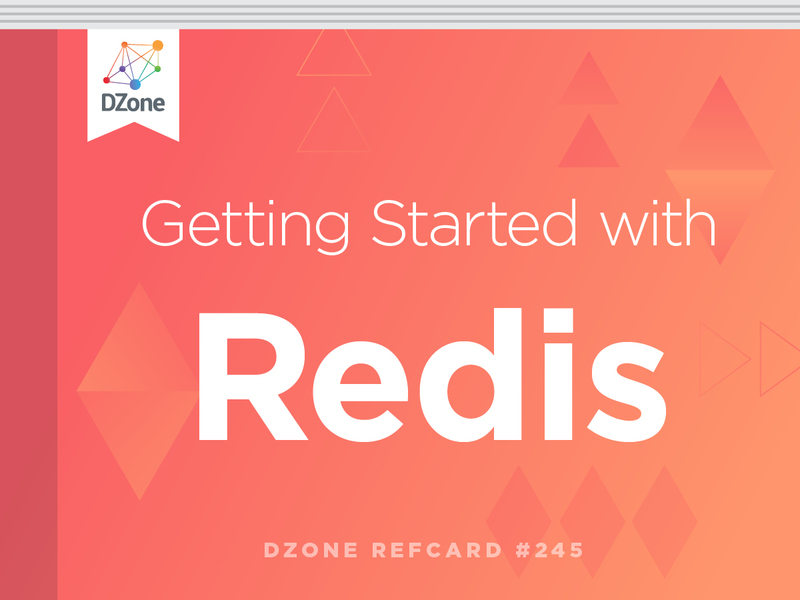 In this Refcard, you will get started on your Redis journey with a simple guide to installing and utilizing Redis, a complete glossary of data types, and the various commands to operate in Redis with detailed examples. Redis is an open-source tool that describes itself as a "data structure server." It allows us to store various data types and access them very quickly because the values are held in memory. If you've had experience with memcached, Redis is a pretty similar tool but has support for more interesting data types. Redis is usually used as an auxiliary data store, meaning there will be a main database (e.g. PostgreSQL or another RDBMS) as well as Redis. Redis is used for transient data, for caching values for fast access, and for data that could be recreated such as session data. Redis isn't persistent storage by default, although it can be configured to persist — so never store anything here that you can't afford to lose. Also, since this is an in-memory data store, the size of the data that can be stored will be related to the size of the RAM available. string: This is your basic key/value pair. hashes: The value of this type is itself pairs of keys and values; it's useful for storing objects. lists: Allows multiple values in a particular order; performs very well if you only add or remove items from either end of the list (called "head" and "tail"). sets: Allows multiple unique values in any order. You can add, remove, and check for any value in the set without performance penalties but cannot add duplicate values. sorted sets: Sets where each value also has a "score." The data is stored sorted by the score, making it very quick to retrieve data using these values. The instructions on https://redis.io/download should be your starting point for all platforms, and these are actively maintained. You can also ask your usual package manager (brew for OS X; yum or apt on Linux) for a package called "redis" and go from there. This tool has few dependencies, and while it isn't officially supported for Windows, there are ports available that will let you at least try it out if that's your platform. You can use these commands either from your language-specific library (in which case they will be named the same as the raw commands) or from redis-cli itself. The commands aren't case-sensitive, but are usually displayed as uppercase by convention. MONITOR shows every action taking place on the server. This is very useful for debugging, but gets noisy on a busy Redis server or with monitoring running. INFO shows the current Redis config. KEYS [pattern] finds all the keys that match the pattern. You can supply wildcards, too, such as ? to match one character or * to match none/one/many. SCAN also has sister commands HSCAN, SSCAN, and ZSCAN that will be covered under the hash, set, and sorted set sections respectively. TYPE [key] can return information about the datatype stored in a particular key. This is useful for finding out which of the prefixed commands to use to work with a particular key. H for hashes; S for sets; Z for sorted sets (because we already used S). L for lists, operations on the left-hand end of the list. R for lists (obviously! ), operations on the right-hand end of the list. There are some other conventions such as using M for operations that handle multiple values and B for blocking operations. By keeping the keys descriptive and well-organized, it becomes easier to find data. It also becomes easier to identify data that is no longer needed. Since Redis is an in-memory datastore, being conscientious about tidying up is very important! There's more information about expiring keys in the "Persisting and Expiring Data" section. If you're counting items or otherwise working with numbers, there are some shortcut commands to make life easier. INCR and DECR increment/decrement values (and create them if the key didn't already exist); INCRBY and DECRYBY add/subtract values from the current value. Redis uses the string type to support other features, such as bitmaps. This is where values are written to individual bits in a string and used as a very compact way of storing, for example, a bunch of boolean fields for a particular item. The string is considered to be a string of 2^32 bits, all set to zero. GETBIT sets a particular bit in the bitmap; SETBIT gets a particular bit in the bitmap. Hashes store multiple fields as the value for a particular key. They are a neater way of keeping related values together than using many similarly-named keys, for example. It's common to use a hash to store an object with properties, making use of the ability to set multiple fields. Reading and writing individual fields is fairly easy using the HSET and HGET commands, and there is also support for operations handling multiple fields in one command. HLEN returns the number of fields in the hash. HKEYS: The fields in the hash. HVALS: The values of the fields in the hash. HGETALL returns keys interlaced with field values. HEXISTS checks if this field exists in the hash. We can also inspect within a hash using the HSCAN command, which is especially useful on large hashes or when looking for a specific group of fields within a hash. This works like the SCAN command mentioned above, using cursors to paginate the results as appropriate. Lists in Redis are a chain of values implemented by a linked-list data structure. Lists are very performant to work with when only the values near the beginning or end of the list are operated on. In Redis, these are visualized as the "left" and "right" ends of a list and have commands prefixed with L and R respectively. To add things onto either end of the list is a PUSH command and to remove and return things from an end is a POP command. Lists are useful for implementing stacks or queues in Redis. LPUSH adds a new value onto the left end of the list. RPUSH adds a new value onto the right end of the list. LRANGE returns some items from the list, specifying how many and where to start. LPOP removes the leftmost value from the list and return it. RPOP removes the rightmost value from the list and returns it. LLEN returns how many items are in the list. LSET puts a value at a particular location in the list (must be within the current range of indexes of the list). LINDEX gets a value from a specific position from either the left or right ends of the list. LINSERT places a value before or after a particular other value anywhere in the list (performs better near the left end because there are fewer items to traverse). Redis has both sets and sorted sets, which are pretty similar but do use separate commands. This section covers the non-sorted variety first, with the sorted ones detailed a little later on. Sets are keys with multiple unique values, which can be useful for a use case where values cannot be duplicated. Sets are also great for comparing and combining together to answer questions that would be tricky with, for example, a traditional relational database store. Sorted sets sound a lot like sets, but in truth, the minor differences make them handy for quite different use cases. For sets, we hold multiple things alongside one another, but the sorted sets are great for counting things, leaderboards, and other short-term counting tasks. Since the sorting for sorted sets goes from low to high by default, many of the commands for working with sorted sets (all prefixed with Z) have matching "sister" commands that reverse the order. The reverse order means that the highest scoring item appears first in the list. We've touched on the importance of keeping Redis data tidy. One way to achieve this is to set keys to expire after a certain amount of time so that they "decay" out of storage. On the flip side, sometimes you really do want your data to remain intact. In this section, we'll also look at the configuration settings for Redis that will allow some or all of your data to survive a program restart. Setting keys to expire is a good way to make the most of the storage available to Redis because it avoids old data hanging around and taking up space. Note that expiry is only at the key level — it isn't possible to expire nested values, so it's useful to consider expiry policies when designing data structures. By default, Redis isn't reliably persistent. The out-of-the-box settings have it snapshot to disk at intervals, but rest assured that this will never have happened immediately before the server fails! This is basically by design; Redis is a blisteringly fast datastore because it stores in-memory and doesn't write to disk. That said, there are definitely some situations where more persistence than "probably none" would be desirable. Snapshotting is used periodically, but this period can be configured to meet the requirements. Beware that frequent snapshotting will affect performance on busy systems. The shapshot feature is also a good way to take a backup of Redis. This is technically referred to as the RDF (Redis Data File) option. Changelog writes each Redis command to a file, syncing it to disk in the background at (configurable) intervals. This AOF (Append Only File) approach is a good way to capture changes and also gives a useful log that can be parsed if required. In practice, most Redis installations will use a combination of these two approaches to give the best possible performance/recovery options. There is excellent documentation available for this (https://redis.io/topics/persistence) that also covers the details of backing up with RDF files and how to restore. The channel this relates to. > PUBLISH whispers "hello ... world"
Redis is such a nice, lightweight data storage tool that it makes an easy addition to almost any application. It's also possible to build upon the Redis features to create extra functionality. A good example of this is using a Redis installation as the basis for a simple queue. There are some fairly fully featured queue solutions based on Redis (such as Resque: http://resque.github.io/), but a simple solution can be created using the list datatype. For the component that will be processing the queue items, we could use RPOP to fetch things from the right-hand end of the list. This approach needs caution, however; if the list is empty and the worker repeatedly tries to read from it, then there will be a lot of wasted resources spent trying to read an empty list! Instead, we can use the blocking features for our list and take items with BRPOP. Using the blocking commands means that the command will wait a little while to see if an item appears in an empty list before returning. There are many features that can be implemented by building on top of the data types made available by Redis. Sometimes, we want to combine operations in Redis, having them happen "at the same time" or not at all. In support of this, Redis supports transactions. Be aware that the transaction won't be rolled back if one of the commands fails; transactions in Redis are more like a queue and then they batch operate on all those commands at once. Redis is an open-source tool that describes itself as a \"data structure server.\" It allows us to store various data types and access them very quickly because the values are held in memory. If you've had experience with memcached, Redis is a pretty similar tool but has support for more interesting data types. lists: Allows multiple values in a particular order; performs very well if you only add or remove items from either end of the list (called \"head\" and \"tail\"). sorted sets: Sets where each value also has a \"score.\" The data is stored sorted by the score, making it very quick to retrieve data using these values. The instructions on https://redis.io/download should be your starting point for all platforms, and these are actively maintained. You can also ask your usual package manager (brew for OS X; yum or apt on Linux) for a package called \"redis\" and go from there. This tool has few dependencies, and while it isn't officially supported for Windows, there are ports available that will let you at least try it out if that's your platform. > MSET hat blue bag red\nOK\n> KEYS *\n1) \"hat\"\n2) \"bag\"\n> KEYS h*\n1) \"hat\"\n> KEYS ?a?\n1) \"hat\"\n2) \"bag\"
> scan 0\n1) \"9\"\n2)  1) \"key:18\"\n    2) \"key:13\"\n    3) \"key:7\"\n    4) \"key:15\"\n    5) \"key:5\"\n    6) \"key:1\"\n    7) \"key:14\"\n    8) \"key:8\"\n    9) \"key:12\"\n   10) \"key:4\"\n> scan 9\n1) \"31\"\n2)  1) \"key:20\"\n    2) \"key:3\"\n    3) \"key:21\"\n    4) \"key:19\"\n    5) \"key:2\"\n    6) \"key:6\"\n    7) \"key:9\"\n    8) \"key:16\"\n    9) \"key:17\"\n   10) \"key:11\"\n> scan 31\n1) \"0\"\n2) 1) \"key:10\"
By keeping the keys descriptive and well-organized, it becomes easier to find data. It also becomes easier to identify data that is no longer needed. Since Redis is an in-memory datastore, being conscientious about tidying up is very important! There's more information about expiring keys in the \"Persisting and Expiring Data\" section. > SET name Alice\nOK\n> GET name\n\"Alice\"\n> GETSET name Bob\n\"Alice\"\n> GET name\n\"Bob\"
> MSET fruit apple cookie choc-chip\nOK\n> MGET cookie fruit\n1) \"choc-chip\"\n2) \"apple\"
> GET counter\n(nil)\n> INCR counter\n(integer) 1\n> GET counter\n\"1\"\n> INCRBY counter 3\n(integer) 4\n> DECR counter\n(integer) 3\n> GET counter\n\"3\"
> HSET user:alice name alice\n(integer) 1\n> HMSET user:alice dress blue food mushrooms\nOK\n> HGET user:alice food\n\"mushrooms\"
> HSCAN user:ariel 0\n1) \"0\"\n2) 1) \"name\"\n   2) \"ariel\"\n   3) \"superpower\"\n   4) \"mermaid\"\n   5) \"dress\"\n   6) \"green tail\"\n   7) \"sisters\"\n   8) \"6\"\n> HSCAN user:ariel 0 MATCH s*\n1) \"0\"\n2) 1) \"superpower\"\n   2) \"mermaid\"\n   3) \"sisters\"\n   4) \"6\"
Lists in Redis are a chain of values implemented by a linked-list data structure. Lists are very performant to work with when only the values near the beginning or end of the list are operated on. In Redis, these are visualized as the \"left\" and \"right\" ends of a list and have commands prefixed with L and R respectively. To add things onto either end of the list is a PUSH command and to remove and return things from an end is a POP command. > LPUSH rhyme little\n(integer) 1\n> LPUSH rhyme twinkle\n(integer) 2\n> LPUSH rhyme twinkle\n(integer) 3\n> RPUSH rhyme star\n(integer) 4\n> LRANGE rhyme 0 -1\n1) \"twinkle\"\n2) \"twinkle\"\n3) \"little\"\n4) \"star\"\n> LRANGE rhyme 1 2\n1) \"twinkle\"\n2) \"little\"
> LLEN rhyme\n(integer) 4\n> RPOP rhyme\n\"star\"\n> LPOP rhyme\n\"twinkle\"\n> LRANGE rhyme 0 -1\n1) \"twinkle\"\n2) \"little\"
> LPUSH rainbow yellow\n(integer) 1\n> LPUSH rainbow orange\n(integer) 2\n> LPUSH rainbow red\n(integer) 3\n> LSET rainbow 1 green\nOK\n> LINDEX rainbow 2\n\"yellow\"\n> LINSERT rainbow BEFORE green amber\n(integer) 4\n> LRANGE rainbow 0 -1\n1) \"red\"\n2) \"amber\"\n3) \"green\"\n4) \"yellow\"
> LPUSH recent_orders latte\n(integer) 1\n> LPUSH recent_orders chai\n(integer) 2\n> LPUSH recent_orders smoothie\n(integer) 3\n> LRANGE recent_orders 0 -1\n1) \"smoothie\"\n2) \"chai\"\n3) \"latte\"\n> LTRIM recent_orders 0 1\nOK\n> LRANGE recent_orders 0 -1\n1) \"smoothie\"\n2) \"chai\"\n> LPUSH recent_orders mocha\n(integer) 3\n> LTRIM recent_orders 0 1\nOK\n> LRANGE recent_orders 0 -1\n1) \"mocha\"\n2) \"smoothie\"
> SADD coin heads\n(integer) 1\n> SADD coin tails\n(integer) 1\n> SRANDMEMBER coin\n\"tails\"\n> SRANDMEMBER coin\n\"heads\"\n> SRANDMEMBER coin\n\"heads\"\n> SPOP coin\n\"heads\"\n> SMEMBERS coin\n1) \"tails\"
Sorted sets sound a lot like sets, but in truth, the minor differences make them handy for quite different use cases. For sets, we hold multiple things alongside one another, but the sorted sets are great for counting things, leaderboards, and other short-term counting tasks. Since the sorting for sorted sets goes from low to high by default, many of the commands for working with sorted sets (all prefixed with Z) have matching \"sister\" commands that reverse the order. The reverse order means that the highest scoring item appears first in the list. > ZADD product_views 1 table\n(integer) 1\n> ZINCRBY product_views 1 bench\n\"1\"\n> ZINCRBY product_views 1 bench\n\"2\"\n> ZINCRBY product_views 1 wheelbarrow\n\"1\"\n> ZRANGE product_views 0 -1\n1) \"table\"\n2) \"wheelbarrow\"\n3) \"bench\"\n> ZREVRANGE product_views 0 0 WITHSCORES\n1) \"bench\"\n2) \"2\"
We've touched on the importance of keeping Redis data tidy. One way to achieve this is to set keys to expire after a certain amount of time so that they \"decay\" out of storage. On the flip side, sometimes you really do want your data to remain intact. In this section, we'll also look at the configuration settings for Redis that will allow some or all of your data to survive a program restart. By default, Redis isn't reliably persistent. The out-of-the-box settings have it snapshot to disk at intervals, but rest assured that this will never have happened immediately before the server fails! This is basically by design; Redis is a blisteringly fast datastore because it stores in-memory and doesn't write to disk. That said, there are definitely some situations where more persistence than \"probably none\" would be desirable. 1) \"message\"\n2) \"whispers\"\n3) \"hello ... world\"
Sometimes, we want to combine operations in Redis, having them happen \"at the same time\" or not at all. In support of this, Redis supports transactions. Be aware that the transaction won't be rolled back if one of the commands fails; transactions in Redis are more like a queue and then they batch operate on all those commands at once. > MSET hat blue bag red\nOK\n> KEYS *\n1) "hat"\n2) "bag"\n> KEYS h*\n1) "hat"\n> KEYS ?a?\n1) "hat"\n2) "bag"
> scan 0\n1) "9"\n2)  1) "key:18"\n    2) "key:13"\n    3) "key:7"\n    4) "key:15"\n    5) "key:5"\n    6) "key:1"\n    7) "key:14"\n    8) "key:8"\n    9) "key:12"\n   10) "key:4"\n> scan 9\n1) "31"\n2)  1) "key:20"\n    2) "key:3"\n    3) "key:21"\n    4) "key:19"\n    5) "key:2"\n    6) "key:6"\n    7) "key:9"\n    8) "key:16"\n    9) "key:17"\n   10) "key:11"\n> scan 31\n1) "0"\n2) 1) "key:10"
> SET name Alice\nOK\n> GET name\n"Alice"\n> GETSET name Bob\n"Alice"\n> GET name\n"Bob"
> MSET fruit apple cookie choc-chip\nOK\n> MGET cookie fruit\n1) "choc-chip"\n2) "apple"
> GET counter\n(nil)\n> INCR counter\n(integer) 1\n> GET counter\n"1"\n> INCRBY counter 3\n(integer) 4\n> DECR counter\n(integer) 3\n> GET counter\n"3"
> HSET user:alice name alice\n(integer) 1\n> HMSET user:alice dress blue food mushrooms\nOK\n> HGET user:alice food\n"mushrooms"
> HSCAN user:ariel 0\n1) "0"\n2) 1) "name"\n   2) "ariel"\n   3) "superpower"\n   4) "mermaid"\n   5) "dress"\n   6) "green tail"\n   7) "sisters"\n   8) "6"\n> HSCAN user:ariel 0 MATCH s*\n1) "0"\n2) 1) "superpower"\n   2) "mermaid"\n   3) "sisters"\n   4) "6"
> LPUSH rhyme little\n(integer) 1\n> LPUSH rhyme twinkle\n(integer) 2\n> LPUSH rhyme twinkle\n(integer) 3\n> RPUSH rhyme star\n(integer) 4\n> LRANGE rhyme 0 -1\n1) "twinkle"\n2) "twinkle"\n3) "little"\n4) "star"\n> LRANGE rhyme 1 2\n1) "twinkle"\n2) "little"
> LLEN rhyme\n(integer) 4\n> RPOP rhyme\n"star"\n> LPOP rhyme\n"twinkle"\n> LRANGE rhyme 0 -1\n1) "twinkle"\n2) "little"
> LPUSH rainbow yellow\n(integer) 1\n> LPUSH rainbow orange\n(integer) 2\n> LPUSH rainbow red\n(integer) 3\n> LSET rainbow 1 green\nOK\n> LINDEX rainbow 2\n"yellow"\n> LINSERT rainbow BEFORE green amber\n(integer) 4\n> LRANGE rainbow 0 -1\n1) "red"\n2) "amber"\n3) "green"\n4) "yellow"
> LPUSH recent_orders latte\n(integer) 1\n> LPUSH recent_orders chai\n(integer) 2\n> LPUSH recent_orders smoothie\n(integer) 3\n> LRANGE recent_orders 0 -1\n1) "smoothie"\n2) "chai"\n3) "latte"\n> LTRIM recent_orders 0 1\nOK\n> LRANGE recent_orders 0 -1\n1) "smoothie"\n2) "chai"\n> LPUSH recent_orders mocha\n(integer) 3\n> LTRIM recent_orders 0 1\nOK\n> LRANGE recent_orders 0 -1\n1) "mocha"\n2) "smoothie"
> SADD coin heads\n(integer) 1\n> SADD coin tails\n(integer) 1\n> SRANDMEMBER coin\n"tails"\n> SRANDMEMBER coin\n"heads"\n> SRANDMEMBER coin\n"heads"\n> SPOP coin\n"heads"\n> SMEMBERS coin\n1) "tails"
> ZADD product_views 1 table\n(integer) 1\n> ZINCRBY product_views 1 bench\n"1"\n> ZINCRBY product_views 1 bench\n"2"\n> ZINCRBY product_views 1 wheelbarrow\n"1"\n> ZRANGE product_views 0 -1\n1) "table"\n2) "wheelbarrow"\n3) "bench"\n> ZREVRANGE product_views 0 0 WITHSCORES\n1) "bench"\n2) "2"
1) "message"\n2) "whispers"\n3) "hello ... world"